It turns out that the Easter Bunny doesn't only bring chocolate eggs, but also fun arts performances into communities! ArtStarts welcomed Project Soul to ArtStarts on Saturdays in Vancouver and ArtStarts at River Market in New Westminster. 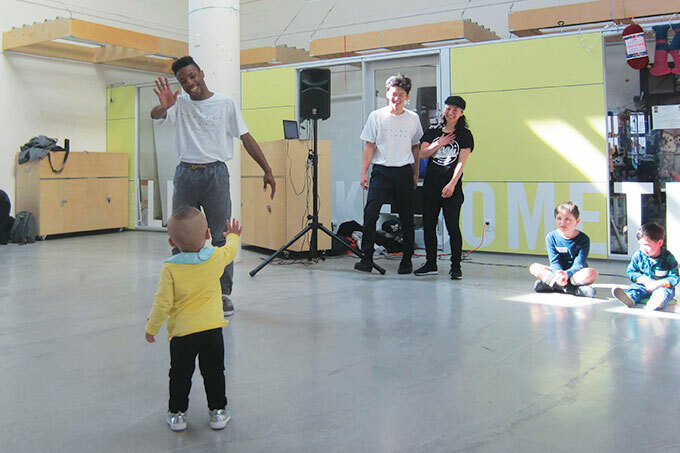 They came to bring their newest interactive dance project, The Routes, to communities for families to explore dance and rhythm together. Saturday was a great performance at the downtown gallery, but unfortunately one of the performers, Amanda, was injured during the second show. That meant that for ArtStarts at River Market the next day, the team at Project Soul was without a critical member of their group and had to put on a whole new workshop. But the crew had been working together long enough to know how to showcase their skills and create a workshop quickly from scratch! Project Soul started with a short display of their many talents. Then they described their styles and talked a little bit about the history of street dance. 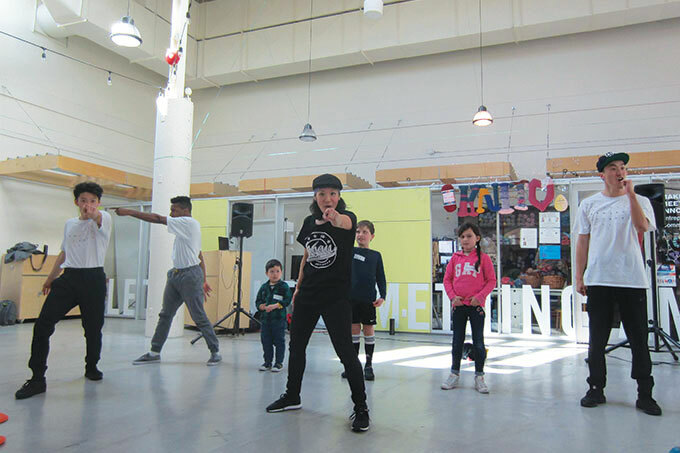 There are many different parts of a street dance performance, and Philip and Jax walked the audience through all of them step by step. First they demonstrated top rock, then foot work, then power moves, and finally freezes. 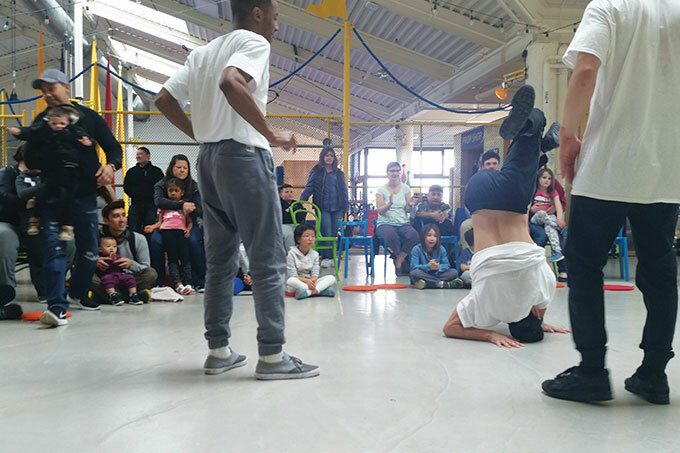 After the audience knew how to construct a street dance, they got a chance to be part of the creation! Volunteers came up and put cards in a random order. These cards had different types of the fundamental parts of a street dance, including a special move (Dabbing!). Philip performed the moves in the random order, and then again after switching the cards around to prove that it was truly on the fly! The volunteers then got to judge a dance battle, B-Boy vs B-Boy, Philip vs Jax. In the morning, Philip won. In the afternoon, Jax won. It was a fair fight! Then Kevin got to teach the audience about his dance specialties. He talked about waacking, style of dance from LA designed to replicate old movies. It was all about contouring your body, and Kevin gave a demonstration. Then he described and performed voguing, a style from the east coast that was about sharp angles, lines and shapes. Kim showed off her moves locking, a style from the soul train, funk era in LA. She got the audience on their feet and taught them three moves. There was power pointing, shocking (like Tom and Jerry!) and locking (like a funky chicken!). The morning group learned a spinning floor move too! The workshop was full of energy and incredibly fun. Project Soul got whole families on their feet, grooving to the music and learning new ways to move their bodies! We thank Project Soul for joining us for ArtStarts on Saturdays and ArtStarts at River Market! Next month at ArtStarts on Saturdays and ArtStarts at River Market, join Will Stroet, the star of Will’s Jams on CBC Kids, for a fun show featuring music from his 2017 Juno- and WCMA-nominated album, Wordplay. Kids will be chuckling and singing along to funny puns, spoonerisms, anagrams, palindromes, rap and poetry.Join us on April 28 and April 29, for complete details, click here! Also, check out ArtStart Explores, our brand new drop-in workshop series for creative and adventurous families held from 11am to 12pm most Saturdays.